CONICET researcher participated in the development of tools for the physical analysis of data that will be provided by the telescope aboard the probe. Alberto Vásquez. Photo: courtesy researcher. From August 12th to 23rd, the Parker Solar Probe (PSP), which will swoop closer to the Sun’s surface than any spacecraft before, could be launched. Uncrewed and with four different scientific instruments, this satellite is going to be piloted from the Earth. For the following 7 years, PSP is going to orbit 24 times the Sun approaching it progressively. The first perihelion (the closest point near the Sun in an orbit), estimated for next November, is going to reach a distance close to 24 millions kilometers, approximately twice as close compared to the shortest separation obtained so far. To illustrate this, the Earth is 150 Myr from the Sun, a distant equivalent to 100 times the diameter of the Sun. The first perihelion will make the PSP be 16 suns away. The closest proximity to the Sun is going to be in 2025, when the PSP will be only four suns away (about 7 millions and a half kilometers). When this happens, the aircraft is going to reach a maximum speed of around 200 km/sec, what will turn it into the fastest artificial object so far. PSP also includes instruments to measure in-situ properties of the plasma of the solar atmosphere along its trajectory and white light telescopes to watch the Sun’s corona. If everything happens as planned, PSP will provide unprecedented measurements that will promote the understanding of the mechanisms that heat and accelerate solar wind. 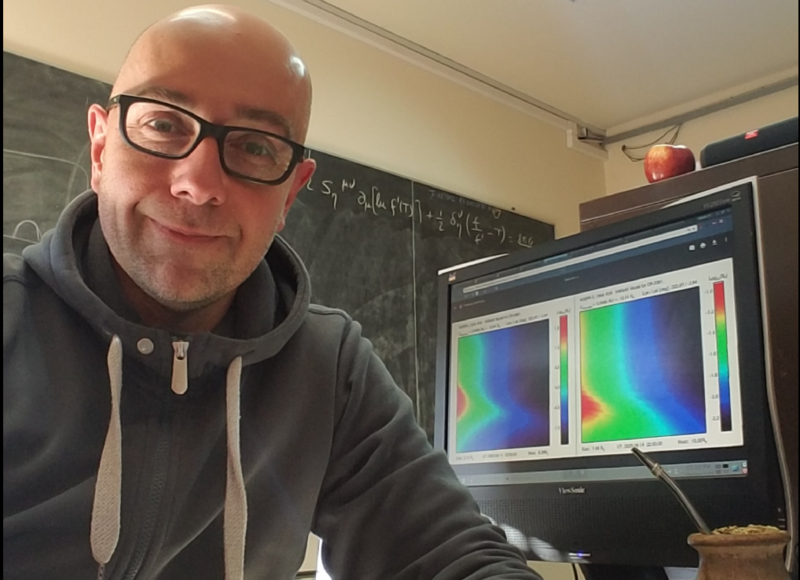 Dr. Alberto Marcos Vásquez, CONICET independent researcher at the Instituto de Astronomía Física del Espacio (IAFE, CONICET–UBA), participated in the development of the tools of physical analysis of the data of the telescope that will be on board on the spacecraft. “At the Solar Physics Group of the IAFE, we develop solar tomography techniques from pictures of the Sun that will deduce the tridimensional structure of the solar atmosphere. In this mission, I provided the tools to make the tomography with a specific telescope. They are different from previous ones because they are going to be very close to the Sun”, Vásquez affirms. He came recently from the University of Michigan where he spent a year analyzing this task with Dr. Richard A. Frazin, who works at that institution. The other three instruments are going to measure in-situ and very accurately the physical properties of the solar atmosphere along the trajectory of the spacecraft. “There’s great interest in understanding deeply the physics of solar atmosphere due to the need to learn about the physical processes per se, but also because of technological reasons. To understand the physical dynamic of the solar atmosphere will improve our capacity for predicting space weather, like when solar storms take place, which impacts on the terrestrial space and, particularly, on human satellite technology, on which we are increasingly independent. This marks the importance of the mission”, says the scientist.